Happy St. Laurence Day! | Language For You! August 10 marks the Feast Day of the early Roman Martyr, the Archdeacon Laurence (Lawrence). The Commemoration is of such antiquity that it is celebrated on the same date in both the Latin and Byzantine Calendars. In the Byzantine Calendar, he is joined by his fellow Martyrs of the persecution by Emperor Valerian in the year 258: Pope Sixtus II, the Deacons Felicissimus and Agapitus, and the Soldier Romanus. The inclusion of a Christian Roman Solider bears out more recent research that Christianity was growingly popular among the ranks of the military, alongside Mithraism. Several legends surround the Archdeacon Laurence, linked to his role as treasurer of the Church of Rome. One story has him receiving the Chalice of the Holy Grail from the Greek Church, and sending it for safekeeping to Huesca, in present day Aragon. That Chalice is today venerated in a chapel in Valencia. The shrine at en:San Lorenzo in Lucinain Rome containing the supposed gridiron used to grill Saint Laurence to death. The most famous part of his legend, however, is how he was Martyred. St. Ambrose of Milan (De officiis ministrorum, 2.28) tells us that when Sixtus was killed, Laurence worked for three days to distribute any resources of the Church to the poor. 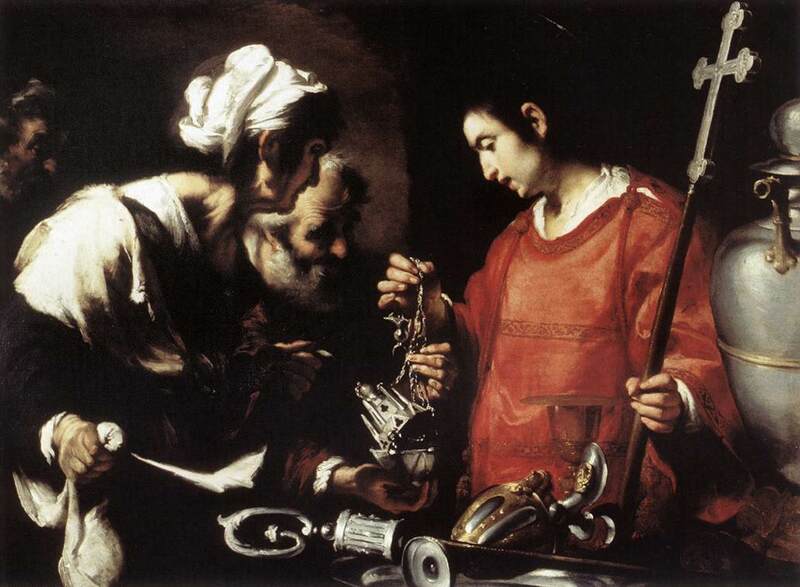 When the Roman Prefect demanded that the Archdeacon turn over the wealth of the Church to him, he presented the poor, the lame, and the sick, and declared that these were the jewels of the Church. An unhappy Prefect then ordered him to be burned on the gridiron. When I was in grammar school, the Sisters transmitted the ancient story that at one point during his roasting, he quipped “Turn me over, I’m done on this side.” Therefore to us kids, as to generations before us, he became the patron saint of Football (Gridiron), Cooks, and Comics. See how legends grow! Modern historians doubt the historicity of parts of Laurence’s hagiography: “the customary and solemn formula for announcing the death of a martyr – passus est [“he suffered,” that is, was martyred] – was made to read assus est [he was roasted]” (Pio Franchi de’ Cavalieri). The Roman edict condemning Christian clergy indicated that they were to be beheaded, and the Liber Pontificalis uses “passus est,” for both Sixtus and Laurence. In any case, he died standing up for what believed, and has been venerated in East and West ever since. I have a particular connection to both the Saint and his Feast. I am named after the first Christian Martyr, another Deacon, Stephen from the Church of Jerusalem. His Martyrdom is recorded in the Acts of the Apostles, witnessed by none other than Saul of Tarsus (later St. Paul). 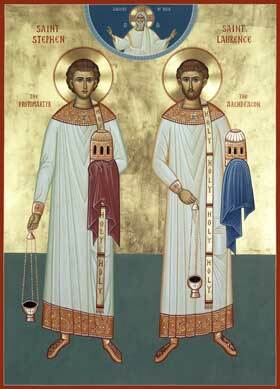 The two Deacon Martyrs are often linked in Iconography and hagiography. Basilica: A Roman Basilica was a high-ceilinged hall for Royal use (βασιλικὴ στοά)–Basilkē stoa. Α 1st century CE Neopythagorean Basilica was unearthed in Rome, and when Christians began openly building Churches in the 4th century, they often followed this architectural pattern with three naves and an Apse. 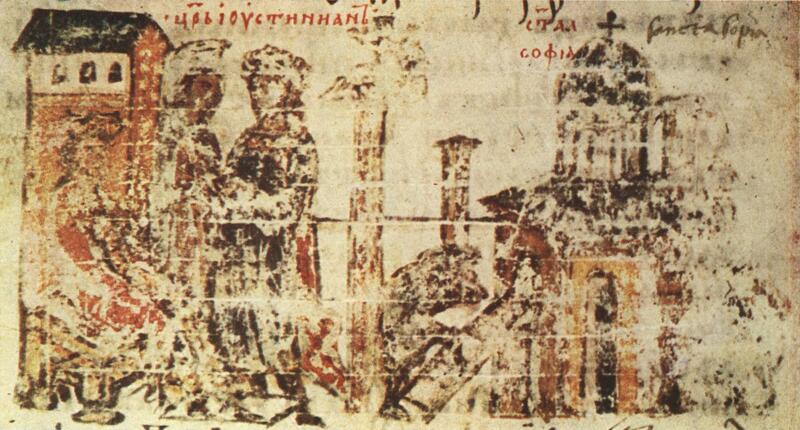 Miniature 38 from the Constantine Manasses Chronicle, 14 century: Construction of Hagia Sophia during the reign of emperor Justinian. Pentarchy: The Christians who made up the groups that were tolerated by Constantine had already organized around urban centers headed by a Bishop. Five of the Major Cities of the Empire began to be recognized as the centers of five “Patriarchates”: Jerusalem (the Mother City of Christianity), Rome (the old Capital), Constantinople (the new Capital), Antioch (“where they were called Christians for the first time”), and Alexandria. Each area had different Liturgical and other usages, and reflected the cultures and philosophical heritage of their localities. This became known as “the Pentarchy”–rule by five. Of course, outside of the boundaries of the Roman Empire, other Patriarchal or Archiepiscopal Sees were recognized, notably the Ethiopian Church, the Churches of Armenia and Georgia (the first two nations to adopt Christianity officially), the Church of Seleucia–Ctesiphon (Persia), and the Church of India (Malabar). In addition, there were many other varieties of Christianity, including Gnostic movements, the Manichaean hybrid of Christianity and other religions, etc. On that day, Wednesday Aug 10, 1972, I made it to the last of the five Basilicas, San Lorenzo. When I got there, I noticed that the statue of the Saint was set up in the middle of the Basilica fully decorated with flowers. Then I discovered that indeed, it was his Feast Day! No wonder. As I explored the monumental cemetery which is attached to the Church, I marveled a this synchronicity.